Facts about Whales, whales are not a fish, despite their appearance. They belong to a group of mammals whose ancestors moved from the land to the sea. They are air breathing and warm-blooded animals that give birth to well-developed young, which they suckle. Whales are well adapted to life in the oceans. They breathe through nostrils, or blow holes, on top of their heads, their bodies are streamlined and their forelimbs have become fins and the hind limbs have become powerful horizontal tails. To keep warm they have a layer of blubber, or fat, which may be up to 16 inches thick. Whales are divided into two main groups, toothed whales and baleen whales. The toothed whales include dolphins and porpoises, which are mainly carnivores and feed mostly on fish. 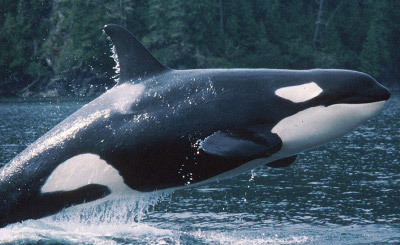 The most ferocious dolphins are the Killer Whale, which eats fish, seals, and other whales. The largest toothed whale is the Sperm Whale, which grows up to 60 feet (18.28 meters) in length and weighs about 50 tons (45.35 metric tons). It feed mainly on cuttlefish and squids. It can also dive to a depth of 3000 feet (914.4 meters) and stay submerged for 90 minutes. The baleen whales feed in a different manner. Inside their mouths they have plates of whalebone, or baleen, which are used to filter small shrimp like animals called krill from the water. A baleen whale may eat several tons of krill during a single feeding. The whale swims through a shoal of krill, sucking water into its mouth. The mouth closes and the tongue forces the water out between the baleen plates, leaving the krill inside. Baleen whales are also the largest whales and they include the right whales and rorquals, such as the Blue Whale and the Humpback Whale. The largest living animal in the world is the Blue Whale, which can reach the length of 110 feet (33.5 meters)and weigh over 170 tons (154.22 metric tons).